"Sira" lead "Svanevit" and "Anne Sophie" in the 8m class off Hanko, 1938. 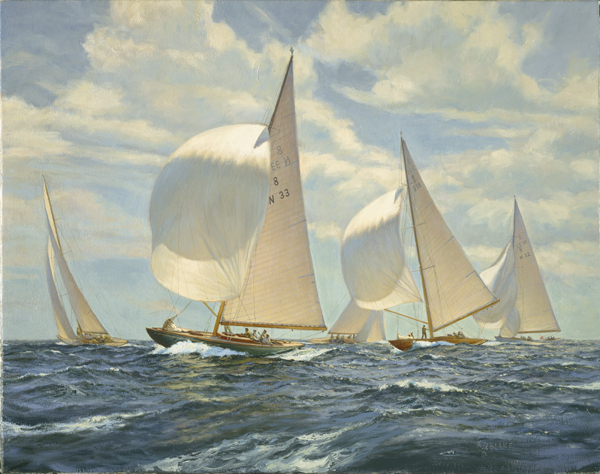 In a beautiful breeze, with sunlight reflecting off the wavetops, "Sira" rounds the windward mark first, followed by "Svanevit" and "Anne Sophie". Two other 8m yachts are still tacking up to the mark. "Sira" was designed by Johan Anker in 1938 for Crown Prince Olav and a group of friends. With Johan Anker at the helm, "Sira" won the 1938 Kattegat Cup for Norway. "Anne Sophie", designed by Bjorn Aas, was also launched in 1938.